This is probably the best of the books I've read for my book club in the over 4 years it's been running, and the one that generated the best discussion. 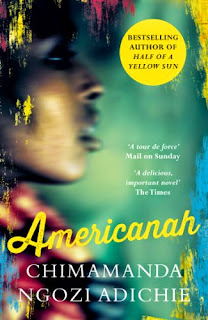 Americanah is the story of Ifemelu, a young Nigerian woman. We meet her at a turning point in her life. After being in the US for over a decade and having built a successful career and relationships, she has decided to move back to Nigeria. The book then moves back and forth, telling us about her life in Lagos as a teenager, her move to the US and the life she builds there, and in the final sections, what happens when she moves back home. The book also tells the story of Obinze, the boyfriend Ifemelu left behind when she emigrated. Obinze always meant to join her in the US at some point, but by the time but when he tries to he finds it impossible to get a visa. He manages to travel to the UK instead, and overstays his visa there. So while Ifemelu is, after some initial struggles, working legally and initiating a career that will culminate in a fellowship at Princeton, Obinze is having to work using someone else's papers and ends up returning to Lagos in disgrace. When he and Ifemelu meet again, though, Obinze has become a rich, succesful man, with exactly the sort of life a wealthy Nigerian is supposed to have. I enjoyed Americanah as a good story with interesting characters I really cared about, but also even more on a political level. Adichie has a lot to say about race and privilege and how they will intersect and create completely different experiences in different countries. I appreciated that aspect of the book most of all, I think: the acknowledgment that there isn't one particular experience of race and racism that is universal. That's what I tend to run across, both online and in books, the assumption that there is one valid racial narrative, and that it is the US one (and to an extent, the British one). When it gets imposed on people from other countries (and those doing it don't even realise that they're doing it), that's a problem. Adichie completely gets it, and even her look at race in the US felt fresh to me. She has fascinating (and completely germane to the story she's telling) dissections of the ways in which Ifemelu's experience of race as an African in the US will be different from the experience of someone who's African American, and how even amongst Africans living in the US, class will determine their experience. It places race in a more global context than I'm used to seeing, and I loved it. Something else I appreciated was the thrill of identifying with a character and her experiences. It's not something that's an important driver for my reading, but it feels good when it happens. There were quite a few instances of visceral recognition here. For instance, the experience of growing up somewhere where you're part of the racial majority and then moving somewhere where suddenly, the privilege of not having to think about race disappears (although you still have the privilege of not having had to spend your formative years in an environment where your race was an everyday issue). You're suddenly part of a minority and there are all sorts of assumptions made about you and your life which you don't even know about, and which might be very far from the mark, especially if you come from a privileged background. Ifemelu's and my experiences weren't identical in this, but they had more in common than not. Some of my favourite sections were when Ifemelu goes back to Lagos after so many years. There were things that cut really close to the bone (I remember the first time I went back to Uruguay for a visit, after about a year and a half in England. The returnees in the Nigerpolitan club, with their incessant moaning about all the ways in which Nigeria is not like the US, had nothing on me. I must have been unbearable). I was also surprised at how similar Ifemelu's circle, the upper middle and upper class elites felt to my former world in Uruguay. Maybe it's that they're both elites that look outwards, rather than inward, and are aspirational about things from abroad. Here in England, the elites are very confident about the superiority of themselves and their culture. Where I'm from, everything from the US and Europe is better. And again, that identification thing when Ifemelu finds them ridiculous and can't help but feel quite derisive. I don't want to make this sound as if the book was one giant screed. Yes, there is a lot more explicit discussion, even preaching, than in most books I enjoy, but it works because there's a story there that works in its own right. Ifemelu feels real, and her snarky, funny voice was very engaging. She's quite the difficult woman, and I love difficult women! There's even a romance there, and one that worked for me, too. I adored this book, please consider reading it! AUDIOBOOK NOTES: If you do consider reading this, I highly recommend the audiobook. It's narrated by an actress called Adjoa Andoh, who truly makes the book come alive. I loved, loved, loved the accents. There is a lot of care taken there; there are differences in the Nigerian accents according to class and according to age (Ifemelu's accent sounded quite similar to that of Adichie herself, which I think is a good sign! ), and quite a lot of variation in the non-Nigerian ones as well. The US ones sounded ok to me, and I'm even more confident that the British ones were good. Also, I particularly liked Ifemelu's voice. It fit her personality, and I liked how her voice would change depending on the situation and who she was talking to, but still remaining the same voice. Very well done.